Boosting an unexpected level of quality for its class, the AC2RV rhythm generator will further enhance your playing. 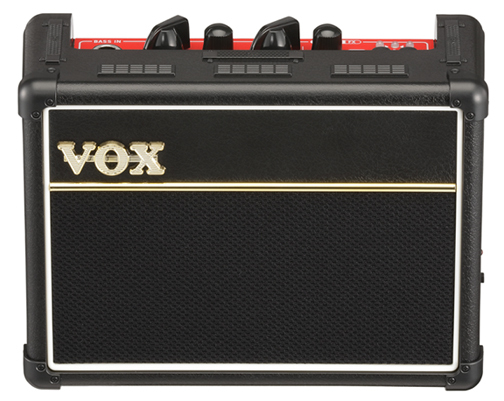 Going beyond the 66 rhythm patterms of the Vox AC1RV, the new AC2RV RhythmVox provides a total of 81 rhythm patterns (9 genres x 9 patterns), all of which were newly programmed for this amp. This rich assortment of on-board rhythm patterns lays emphasis on the classic standard drum beats that will be most useful. Although the AC2RV Rhythm Vox Bass is an extremely compact mini amp, it will surprise you with a realistic bass performance that will exceed your expectations. 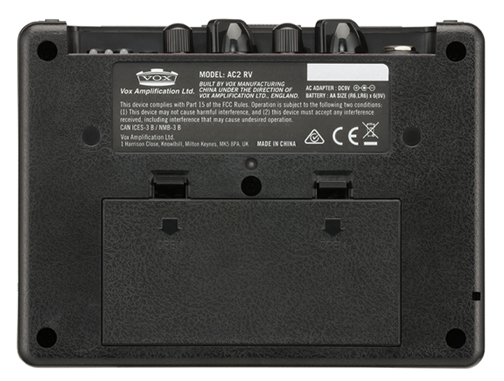 The output of the AC2RV has been increased to 2 watts RMS, further enhancing the amp's sound quality. A pair of 3" Vox original speakers project a powerful stereo image. A three position "MODE" switch toggles between "normal," "flat," and "scoop" equalizations. Three types of digital effects are also included: chorus, echo and reverb. A dedicated E-string tuner keeps you in tune at all times. Use the headphone jack for private practice at any hour. Connect your MP3 player or other external audio source to the AUX IN jack and jam along with songs from your favorite band. Convenient battery power lets you enjoy all these features, any time, any place.